PureVPN is a Hong Kong based VPN service provider and has been providing VPN service since 2006. In this PureVPN review, we will cover PureVPN’s features, server locations, price, security, connection speed and customer support etc. PureVPN has 500+ VPN severs in 141 countries. There’re 80,000 IP addresses to choose from. PureVPN supports the following VPN protocols: OpenVPN, L2TP/IPSec, PPTP, SSTP, and IKEv2. Its Mac desktop client doesn’t support OpenVPN directly, but users can set up OpenVPN separately using third-party software such as OpenVPN Connect etc. Its Windows desktop client does support OpenVPN. PureVPN doesn’t keep user logs, making it a good choice if privacy is one of your top concerns. PureVPN provides software and app for major operating systems such as Windows, Mac, iOS, Android and Linux. It offers unlimited server switching and unlimited data transfer. One convenient feature is called “Split Tunneling”, which allows users to choose which data to send through VPN and which to send through their ISP without going through VPN. Also, PureVPN’s desktop client comes with a Internet kill switch, which is a fail-safe button that helps maintaining user’s privacy and anonymity. For simultaneous connections, PureVPN allows 5 devices to be connected at the same time, which is quite generous compared to many other VPN providers. PureVPN does allow P2P, file sharing and VoIP (while many other VPN providers have restrictions in this respect). PureVPN’s price starts from $2.49 per month (if you pay for 2 year when signing up). 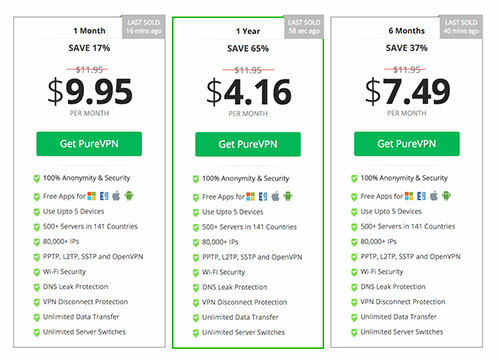 PureVPN offers a 7 day money-back guarantee for users to test out their VPN service. 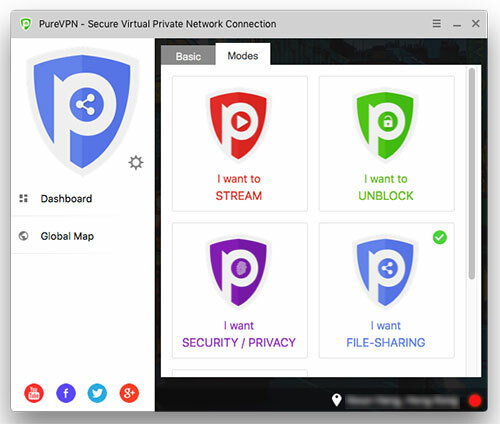 PureVPN provides free VPN software for Windows, MacOS, Linux, iOS, Android and other supported devices such as router, Apple TV, PS3, Roku, Boxee and more. In addition, its VPN can be set up manually on these operating systems and devices. With PureVPN’s client software, users can connect/disconnect VPN, as well as to choose server locations and switch between different VPN protocols. One of the nice features is that the client software allows users to select different modes based on different purposes, for example, streaming, unblocking, security/privacy, file-sharing etc. It also provides a detailed purpose list including selections such as “unblock Netflix”, “Amazon Prime”, “Unblock Sports Channels”, “BBC iPlayer” etc. Ping: 4 ms, Download: 15.12 Mb/s, Upload: 14.94 Mb/s. Ping: 155 ms, Download: 14.58 Mb/s, Upload: 14.37 Mb/s. Ping: 182 ms, Download: 14.00 Mb/s, Upload: 9.63 Mb/s. Ping: 217 ms, Download: 14.23 Mb/s, Upload: 13.79 Mb/s. Ping: 111 ms, Download: 13.23 Mb/s, Upload: 14.61 Mb/s. Ping: 144 ms, Download: 5.87 Mb/s, Upload: 3.29 Mb/s. On PureVPN’s website, there’s a live chat window where you can connect directly to its customer support team. We tried using this method to get support and we were able to connect to a support representative immediately. We were able to get our questions answered using live chat. 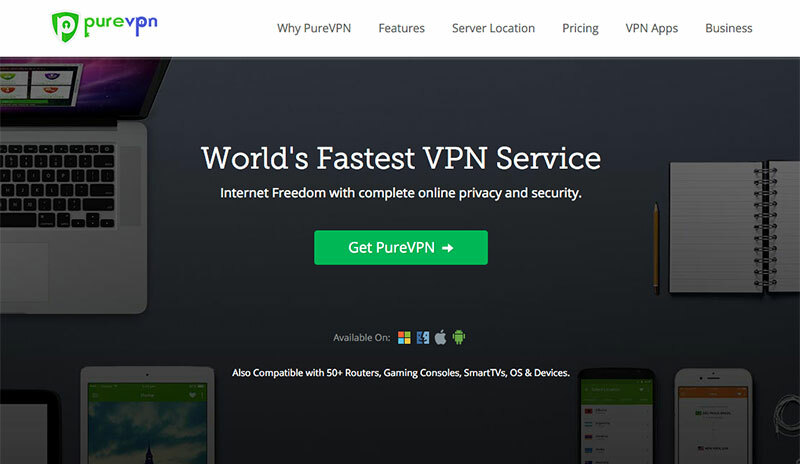 As one of the well-known VPN providers, PureVPN provides stable VPN connections, fast VPN speed, a large number of worldwide server locations and easy to use software. PureVPN has no restrictions on P2P file sharing and allows up to 5 simultaneous connections. Its $4.16/month staring price is at the low end of VPN prices. If you are looking for a low-cost VPN service with rich features, you should consider PureVPN.